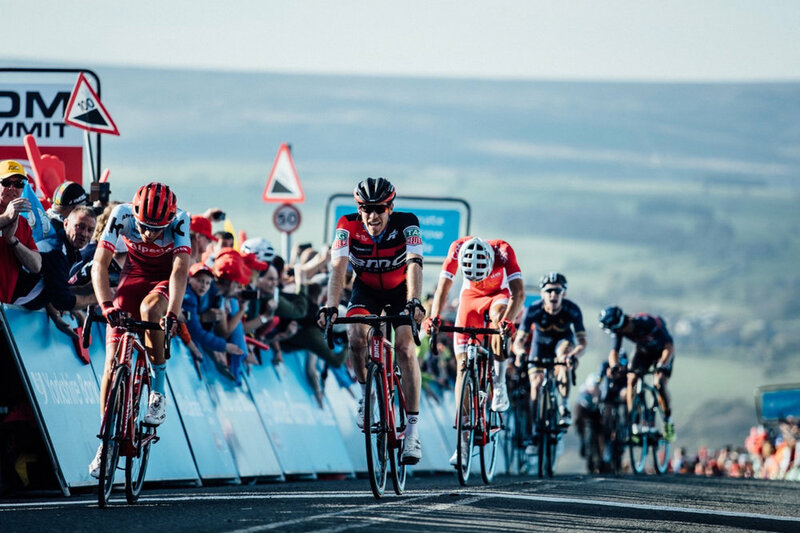 We knew heading into the final stage of the Tour de Yorkshire that we had a good chance of getting Greg the overall win. But this was only possible if we all rode to our potential and laid it on the line for the team. I was hoping to play my chances late in the race, but after a fast start and a solid 7-kilometer climb following neutral, the race opened up. 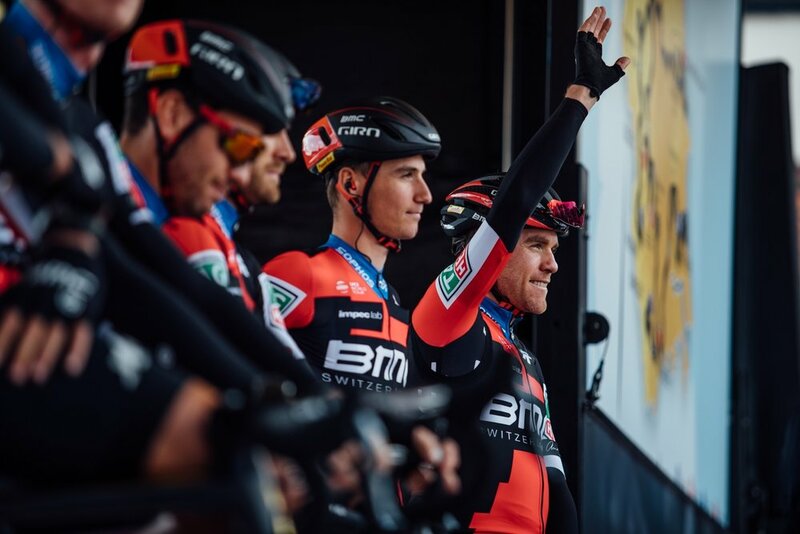 With only four BMC Racing Team guys supporting Greg, I was on duty to look for early moves and find opportunities to apply pressure on other teams. This chance came sooner than I expected and before I knew it, I was away in a strong group of 10 riders. There were multiple guys in the group within a minute of the lead, but I was the highest-placed rider at ~ 20 seconds back. This would definitely put pressure on Astana, and we hoped it would isolate their leader later in the race. Our group worked fairly well together, at least for the first half but being the highest placed rider GC rider meant I was a threat and could win the whole race. This put me in a position of extra pressure and responsibility and I had to figure out how to keep the group moving and working together as long as possible. This would give us the best chance on a physically and technically demanding stage. I had to put in some extra pulls and heavily mark the others as guys tired, shirked pulls and eventually became frustrated and started attacking. Back in the peloton, the race leader was under pressure and showing weakness. Greg came over the radio and said he had super legs and no one could beat him. I knew this likely meant my chances to go for it were over, but I still had a crucial role to play. As Greg’s group caught us, I battled to stay with the best riders as they attacked on the final classified climb. Cort Neilson had been dropped, and now it was up to Danilo Wyss and me to go all-in, sell out for Greg, keep the pace up, and hold the front group together. After a long day out front, I buried myself heading into the finish. I would have loved to hang onto a nice top 10 result by staying in the group, but we raced 100 percent to get the overall win for Greg. It feels good to help make that happen. That ride gave me a lot of confidence heading into Amgen Tour of California. It was also refreshing to have great legs on such a demanding stage and drive a strong break through my favorite type of roads for riding a bike. Stage 3 was the final chance for the sprinters to grab a win at Tour de Yorkshire. While today’s profile was the most demanding so far, we were hoping to mix things up, put other teams under pressure, and create some opportunities for ourselves. Starting with only five guys and obviously wanting to protect Greg made this a tall order, but we gave it a good go. We started our effort with Danilo Wyss and Patrick Bevin setting a stiff pace on a short steep climb with about 50 kilometers to go, which caused some splits in the bunch. 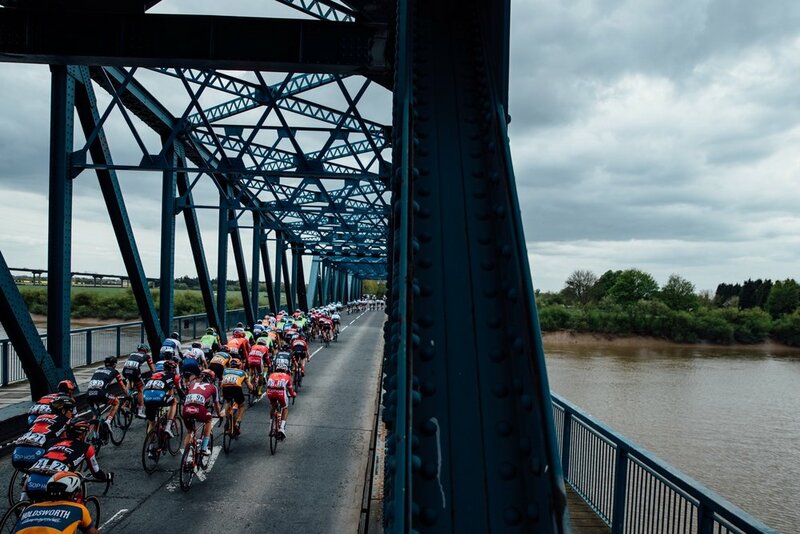 From there, we caught the early break and once the race reset, attacks started flying. With around 25 km to go, I jumped in a move with five guys. We snaked through the outskirts of Scarborough and bounced through some of the city’s cobblestone streets. I hoped that without a full contingent of sprinter’s teams in the main bunch due to the earlier split, there would be a greater chance for us to get a little gap. Despite a big effort from the five of us, they kept us pretty close and brought us back inside the final 10 km. Then Paddy tried a nice move with about 4 km to go, but he also got caught in the closing kilometers. While the bunch sprint was tactical and chaotic, I appreciated the amazing crowds, stunning coastline and breathtaking finish line scene and was pleased that Greg was able to sprint to eighth. Tomorrow will be without a doubt the most demanding day of this race. It features a jagged profile and total altitude gain of a full-on mountain stage, so I think the strongest guys will end up in the front. Hopefully, that means a few of us BMC Racing Team guys are in there going for it. Stage 2 of Tour de Yorkshire was a full-on day of racing, and it was back into hillier and more technical terrain. After the break stuck yesterday, there was a major battle to get off the front and it took around 50-60 kilometers before things settled down. The race was downright chaotic and we were on rollercoaster roads when we lost my roomie at this race, Tom Bohli, to a crash. He got tangled up with a few riders who overcooked a corner while going on the attack. Considering we were already starting one-man down, we immediately felt the loss of Tom. 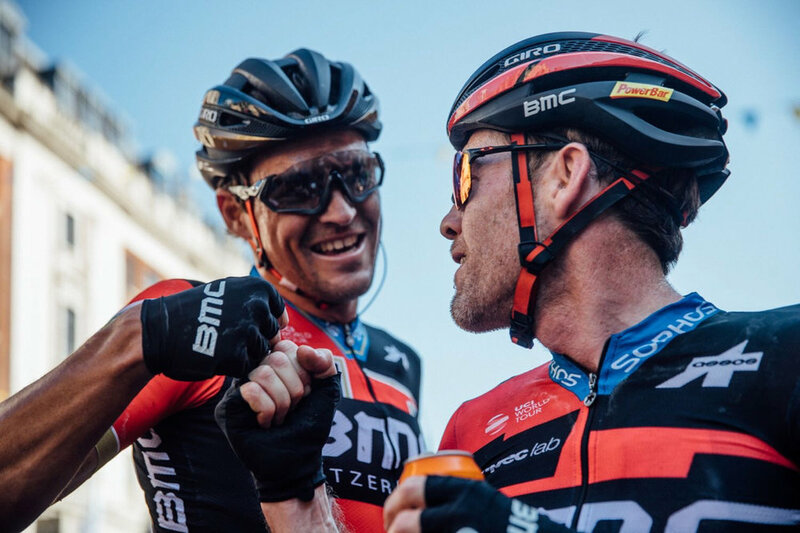 It meant the rest of us BMC Racing Team had to step up and spend a little more energy than was ideal. Fortunately, Paddy Bevin was up there with a key early move and then Nathan Van Hooydonck contributed to the pace making once the break went. Things heated up in the final 25 km and we took the lead for the final approach into the uphill finish. I felt strong, but when the best guys including Greg, made an explosive acceleration with around 700 meters to go, I couldn’t muster much more than a hard steady pace. Greg fought hard for the win and came up just a bit short with a nice second place, while I just snuck into the top 10. We have two unpredictable stages to come, especially Sunday’s final stage, which packs a massive amount of total climbing. We plan to stay heads up and switched on hoping to benefit from our collective depth, even with our reduced team. Stage 1 was a bit uncharacteristic of what I’ve learned to expect at Yorkshire with mainly flat terrain. It was far less hilly than anything we saw last year. Regardless, the roads here always seem quite heavy. So mix that with how long it’s been since I raced and I felt a little sluggish, but I could tell my legs were heading in the right direction and I expect I’ll improve over the days to come. The big thing at today’s race was the break stayed away. I was surprised that happened, but they earned it. We never slowed down once the sprinter’s teams began to ride. I’m not sure how it looked on TV, but I think the decisive moment came in the final few kilometers when we could see the break. Typically, a break will start to attack itself, play games and look at each other, but this group was committed and went all in. It’s a testament to the mentality of the smaller teams. Tomorrow is clearly a big day for the overall GC with the uphill finish. I have never seen this climb, so it’s hard to know how selective it will be. Either way, it looks like a great finish for Greg, so we will look to set him up for a good one.